The Portland Cement Association (PCA) has named Michael Ireland its new president and chief executive officer. Formerly PCA’s chief operating officer, he arrived at the association in January. Before joining PCA, Ireland was with the American Society of Mechanical Engineers (ASME) for two decades, where he served as the associate executive director for over 10 years and, previously, as managing director. Prior to his work with ASME, he was the executive director and CEO of the Association for Facilities Engineering, and executive vice president and CEO of the National Environmental Balancing Bureau. Read PCA’s release. 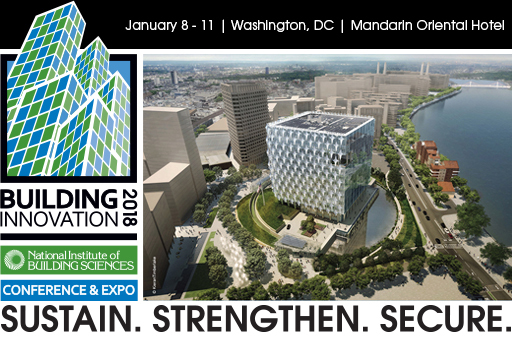 Building Innovation 2018: The National Institute of Building Sciences Sixth Annual Conference & Expo, to be held January 8-11, in Washington, D.C., is a great way to earn continuing education units (CEUs) while hearing from a diverse group of speakers. This is the industry’s only all-inclusive Conference where members of the entire building community come together to connect, collaborate and create solutions that benefit the built environment. The goal for Building Innovation 2018 is to explore strategies to Sustain. Strengthen. Secure. The Conference is delivering educational content designed to engage the entire building community, cover a variety of concepts and present diverse perspectives during each session to stimulate creative ideas, present new approaches and develop workable solutions for the entire building industry. Building Innovation 2018 sessions have received approval for a total of 31 Learning Units (LUs) from the American Institute of Architects, many of which are Health, Safety, Welfare (HSW) hours, as well as 31 contact hours from the International Code Council for a total of 3.1 CEUs. AIA and ICC members must provide their member numbers upon registration. View the full schedule. Online registration ends December 31, 2017. Register today! Looking for a good reason to register to attend Building Innovation 2018: The National Institute of Building Sciences Sixth Annual Conference and Expo scheduled for January 8-11, 2018, at the Mandarin Oriental in Washington, D.C.? There are plenty of reasons to be there where Science meets Design®. During this annual event, building industry professionals will gather to explore strategies that Sustain. Strengthen. Secure. Building Innovation 2018 is the one place to be as representatives from the entire building community take part in sharing ideas, learning from industry leaders and playing an active role in creating solutions for the built environment. For four days, attendees can connect with colleagues, hear about and see some of the latest advancements in innovative products and tools, and get a jump start on earning valuable continuing education units from both the American Institute of Architects and the International Code Council. At Building Innovation 2018, you can . . . 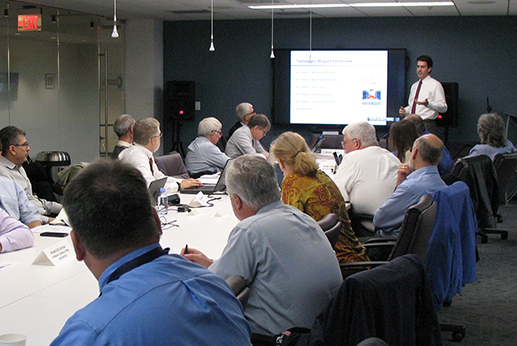 Engage with other industry professionals in shaping the work of the Institute’s Councils including the National Council on Building Codes and Standards, Multihazard Mitigation Council, buildingSMART alliance and Off-Site Construction Council. View the full schedule. Register to attend. Online registration for Building Innovation 2018 will end on Sunday, December 31, 2017. This is your last chance to save on registration and avoid the lines onsite. If you're planning to attend the National Institute of Building Sciences Sixth Annual Conference & Expo, January 8-11, 2018, at the Mandarin Oriental in Washington, D.C., register now to save $150 or more off onsite registration! Don't spend more to be there as the Institute connects industry professionals to explore strategies that Sustain. Strengthen. Secure. Save on four enriching days packed with three keynote addresses; 55 expert speakers; 20 educational sessions offering 31 learning units; four social networking events; an inspiring awards ceremony; and the latest in industry science and technology in the Exhibit Hall. Register now! The Commercial Workforce Credentialing Council (CWCC) Blast Protection Board of Advisors (BPBOA) meets in Washington, D.C. in early December to review the results of the development of a Job Task Analysis (JTA) and International Organization for Standardization (ISO) standard 17024 credentialing requirements for Blast Protection Professionals. The CWCC BPBOA offered their direction to the process to help ensure the JTA and credentialing requirements reflect industry and government requirements. The National Institute of Building Sciences will unveil the Natural Hazard Mitigation Saves: 2017 Interim Report at a presentation luncheon Thursday, January 11, 2018, from 12:00 to 1:30 pm, during Building Innovation 2018 Conference & Expo. 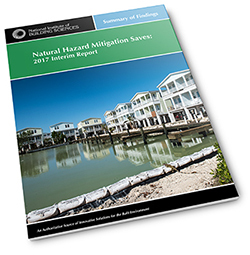 The report, which highlights the significant savings that result from implementing mitigation strategies in terms of safety, and the prevention of property loss and disruption of day-to-day life, builds on the well-known 2005 report of the same name. Members of the Institute’s Mitigation Saves project team and sponsors of the report will provide an overview of the Natural Hazard Mitigation Saves: 2017 Interim Report and initial findings, discuss the methodology, offer public- and private-sector perspectives of the findings and identify next steps. Panel speakers include: Ryan Colker of the Institute; Philip Schneider and Keith Porter from the Mitigation Saves project team; and sponsors Roy Wright of the Federal Emergency Management Agency and Sara Yerkes of the International Code Council. Read the full release. Attend the Mitigation Saves Presentation Luncheon or select the full Conference. Register now. Plan on attending the Multihazard Mitigation Council (MMC) Annual Meeting at 3:00 pm on Monday, January 8, 2018, during Building Innovation 2018: The National Institute of Building Sciences Sixth Annual Conference and Expo at the Mandarin Oriental Hotel in Washington, D.C. Learn about MMC’s future plans for the Mitigation Saves 2017 Interim Report, to be released at a Thursday, January 11, luncheon, and find out about the Resilience Advantage Mortgage being developed with the Council on Finance, Insurance and Real Estate. See the full conference schedule. Members of the Facilities Maintenance and Operations Committee (FMOC) would like to make you aware of the opportunity to attend their annual committee meeting on January 9, from 3:30 pm–5 pm EST in the Hirshhorn Room of the Mandarin Oriental Hotel, 1330 Maryland Avenue, SW, Washington, D.C. The Council meeting will be held in conjunction with Building Innovation 2018: The National Institute of Building Sciences Sixth Annual Conference & Expo, January 8–11, at the Mandarin. Interested professionals are invited to share your knowledge and passion for excellence in facilities management with like-minded professionals as we discuss opportunities for collaboration, knowledge sharing, publications and outreach opportunities for you and your firm, as well as the revamping of the committee’s roadmap to this year’s endeavors. Meet the new officers and network with the committee members. The FMOC also would like to call your attention to the conference’s Wednesday, January 10, 1:45 – 3:15 pm session, featuring “Demystifying Facility Transition Planning: Moving from Construction to Operational Readiness” by Eric Dillinger, and Casey Martin of Jacobs and “Designing for Operational Efficiency: How to Better Integrate Facility Management Perspectives in Design,” by Saleh Kalantari, University of Houston.) Go to the Institute’s website to register and check out the conference program. In just two weeks you can register to attend the fifth BEST Conference Building Enclosure Science & Technology. BEST5 scheduled for April 15-18, 2018, will be held in the historic city of Philadelphia, Pennsylvania at the Loews Philadelphia Hotel. Be there where Science meets Design® to hear from researchers and practitioners as they share their knowledge and lessons learned on the science and art of building enclosure. 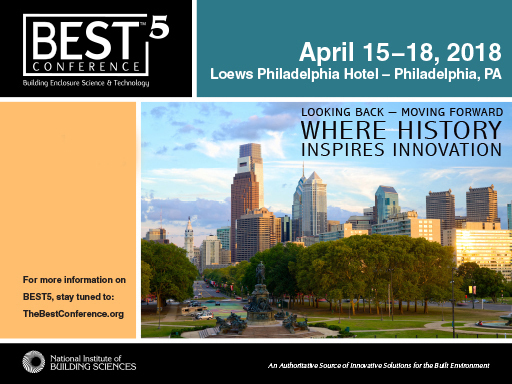 The National Institute of Building Sciences Building Enclosure Technology and Environment Council (BETEC) and the Building Enclosure Council (BEC) – Philadelphia are set to deliver a program aimed at Looking Back – Moving Forward; Where History Inspires Innovation. Join us to take part in concurrent technical sessions, plenary addresses, a commissioning workshop and a tour of the first international style skyscraper constructed in the United States. Sign up for updates at www.TheBestConference.org! Sponsors and Exhibitors: There are some spaces remaining to show off your contribututions to building enclosure. Don’t miss out on your chance to reach the BEST5 audience. Reserve your space today! Download the event prospectus. The buildingSMART alliance (bSa) will host its Annual Meeting at 1:00 pm, Monday, January 8, 2018, during Building Innovation 2018: The National Institute of Building Sciences Sixth Annual Conference & Expo at the Mandarin Oriental Hotel in Washington, D.C. Learn about bSa’s plans for developing the next edition of the nation’s building information modeling standard,the National BIM Standard – United States® (NBIMS-US™). See the full conference schedule.